Coming up to that time of year again. Time to dust of that old idea for a film you once had and actually make it happen this year. There will be fun times. I will ellaborate on the details as they emerge. The main thing right now is to get making those films. 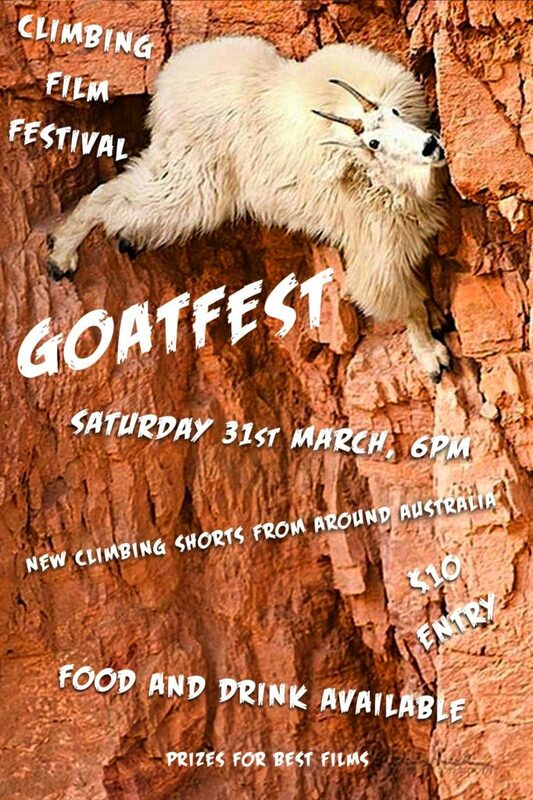 Goatfest 6pm this saturday night at the Soldiers memorial hall in Natimuk. Last chance to get films to me if you want to be a part of the action and in the running to win one of 2 $250 vouchers from Arapiles Mountain Shop. Stuey, are you entering a gerbils go climbing film? ... I’d pay $’s to see a collaborative film on that topic from you/simey/Eduardo - along the style of the Straddie Tyrolean extravaganza. How"d Goatfest go for those of us who couldn't make it? Any films end up in the public arena for viewing by the wider audience? It all went reasonably smoothly. A few technical isues at the start mostly due to me only recieving the last few films on the day of the event (seems to be par for the course). and "Roots, Rock, Arapiles" received a special mention. Simey's " Dueling Handdrills - Middendorf v Matheson " won the Jury prize and will probably be making its way online in the not too distant future. A Filmmaker Q&A after the shorts was (I think) a good addition an people got a chance to hear from the film makers about their thoughts and visions behind the films. Then we finished off with a screening of Simey's "Arapiles the Musical"
I thought the Q and A was good. Although I was smoking a ciggie outside after the movies when I first heard I was to go on stage. It was an effort to inspire more people to make a film. Get amongst it!